Virgin Australia plans to consolidate its turboprop operations to routes within the ACT, New South Wales and Victoria as it prepares to reduce the number of ATRs in the fleet from 14 to six. A memo to staff from Virgin Australia group executive for airlines John Thomas, as seen by Australian Aviation, said all six ATR 72-500s would be withdrawn along with two ATR 72-600s. This process would begin in July. As a result, the airline will end turboprop operations in Queensland. “The consolidation of ATR flying will unfortunately result in the closure of the Brisbane ATR flightcrew base to ensure our crew are positioned in the locations which best support the remaining ATR network,” Thomas said in the memo. “We recognise that this may be disappointing news for some of you, however this will ultimately help us achieve a sustainable fleet and network mix to meet customer needs and continue to provide further opportunities for our people. The decision to reduce Virgin’s ATR fleet, as well as its Embraer E190 regional jet fleet, was first announced in June 2016. Thomas said Virgin there would be a consultation period for affected staff. Currently, Virgin operates ATRs from Brisbane to regional Queensland destinations such as Moranbah, Gladstone, Bundaberg and Rockhampton, as well as to Port Macquarie in NSW. However, the downturn in the resources sector has led to a a drop in demand on a number of Queensland regional routes. While a Virgin Australia spokesperson confirmed the existence of the memo, the spokesperson was unable to offer any additional information on what the decision would mean for routes currently served with the aircraft to be withdrawn. 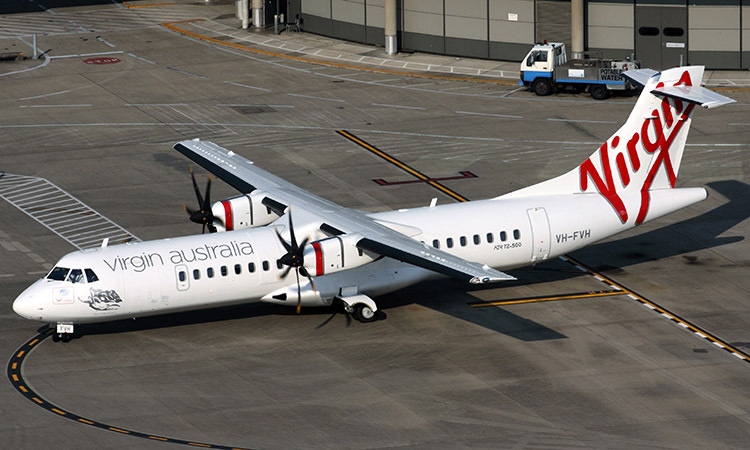 In his Traffic column in the May edition of Australian Aviation, Gordon Reid reports the six ATR 72-500s to be withdrawn by July are VH-FVH, VH-FVI, VH-FVL, VH-FVM, VH-FVU and VH-FVX. Virgin Independent Pilots Association (VIPA) president John Lyons said the airline had offered all affected pilots new roles in Brisbane or at another base. Further, Captain Lyons said cabin crew were expected to be retrained onto other fleet types such as the Boeing 737. “They may move to remain on the same aircraft or remain in Brisbane to fly on a different fleet,” Captain Lyons told Australian Aviation. VIPA represents about 60 per cent of pilots at the Virgin Australia group of airlines, comprising Virgin Australia, Virgin Australia International, Tigerair Australia and Virgin Australia Regional Airlines (VARA). One such example of a wet lease arrangement is Virgin’s Brisbane-Emerald service, which is operated by Alliance Aviation on behalf of Virgin with Fokker 70s. Figures from the Bureau of Infrastructure, Transport and Regional Economics show passenger traffic on Brisbane-Gladstone fell 18.3 per cent in the 12 months to December 31 2016, compared with the prior corresponding period. Meanwhile, Brisbane-Moranbah was down 15.4 per cent and Brisbane-Mount Isa (which Virgin serves with Fokker 100s operated by Alliance Aviation Services) was 7.3 per cent lower. The memo said Virgin was “investigating a number of different options” for the future of its regional Queensland routes that were currently served with ATRs. In addition to Queensland, Virgin’s ATR fleet is used on intrastate routes from Sydney, as well on Sydney-Canberra and Melbourne-Canberra services. On February 17, Virgin reported a statutory net loss of $36.1 million, falling back into the red from net profit of $45.7 million in the prior corresponding period. Underlying profit before tax, which removes one-off items and is regarded as the best indication of financial performance, was $42.3 million, a decline of 48 per cent from $81.5 million in 2015/16 first half. Revenue dipped 0.9 per cent to $2.63 billion. A slide presentation accompanying the financial results showed Virgin booked $69.8 million in restructuring changes in the 2016/17 first half as part of its “Better Business” program, which aims to reduce costs through fleet simplification and operational efficiencies in catering, maintenance and fuel consumption. Virgin said the program was on track to achieve net free cash flow savings of $300 million by the end of 2018/19. Virgin could place one on NTL – MEL service and give Jetstar some competition. They already fly jets on the NTLMEL sector. So there is already competition. If they put an ATR on it it would be a flight over two hours…… on a turbo prop that is one of the most unreliable aircraft in the world! Maybe Virgin shouldn’t have acquired 14 ATRs in the first place. A bit disappointing to say the least.if this is the case soon the smallest plane VA will offer and this applies anywhere in the country will be a 737.most of regional Australia can’t take a plane that size meaning people have to go Qantas Link or be subjected to long bus,train trips or driving on their own. What a sad day for regional aviation? $ B4 peeps that keep you flying..
Gee QantasLink must be absolutely loving this! Fares to Bundaberg will double overnight. I’ve not heard about the ATR being unreliable? Should have entered into an alliance with REX or Alliance instead of further segmenting the regional market if they weren’t prepared to commit to it “rain, hail or shine”. Bundaberg in particular will surely suffer from lack of competition as it did prior to Virgin’s arrival. I hope they make good with REX. VIPA represents a tiny minority of ATR pilots and are irrelevant in the situation here – to have comments from their President would be amusing, if they weren’t so false and it wasn’t for the fact people and there family’s lives are being wrecked. There are redundancies if crew are unable/do not want to leave BNE. The number of BNE positions on other fleets is close to zero for ATR pilots being so low on seniority. Bris mbah still flying often at near capacity. Looks like more freq flyer points with Qantas I guess. Sad to see virgin out of regional Qld. 100 points to gain platinum as well. Just about every other airline that operates ATRs can make a profit from them. Why can’t Virgin do as well? The airline has fundamental problems that it cannot get round of. The sad day has already arrived a check of flights in and out of regional Rockhampton today, saturday, finds only 3 services to And from Brisbane, one by soon to be witdrawn vh-fvl and two E 190’s. Such a reduction on the suppy side can only drive up seat price and improve Virgins bottom line if passengers cop reduced service and higher prices. What is to be watched is the competitor Qantas which has 4 flights on the same route and whose turbo prop serviced flights might become more popular if Virgins E190’s and the peak business hours 737 services are reduced. Air travellers to and from Rockhampton might not prefer to fly Virgin in the future if flight frequency and travel times fall behind those offered by Qantas. Well it appears virgin have just handed regional Queensland over to QantasLink . Ok they may have not been making the returns on these routes but I’m sure they were feeding into the wider virgin network. Can’t there array of shareholders see this as well , eg joe blogs in Gladestone wants to travel to Singapore could book through virgin via bne then onto Singapore airlines , oh well looks like they handed Qantas more customers. It’s like the jet is running but there’s no pilot to fly virgin in the right direction, sad day for completion in regional qld. @ Franz Chong. Thats not true. The ATRs will continue to fly in NSW and Vic. Also under the Skywest banner, they have F100s that could be deployed on other routes on the East coast. must be lots of “routes within the ACT” ? Didn’t think anyone flew CBR/OOM ? Does this mean that some of the Virgin ATR routes in Qld will be operated by Alliance F50’s ? Think they are 50 seaters aren’t they ? I actually like the ATR from a passenger perspective. I fly it approx monthly PQQ-SYD vv and it does seem roomier than the Q300 or Q400 that QF operate. The Dash 8 might be faster but the ATR, particularly the 600 feels more modern. I’ve often wondered why VA regional and Rex don’t merge. That way the Saabs could be replaced with new ATR 42-600s on existing Rex routes and the ATR 72 could be used for higher density routes/existing VA routes. If they’re getting lower demand in QLD then could deploy the ATR 42 there as well. Rather than ceding ground to QF. Otherwise regional fares will skyrocket, just like the dark days following the Ansett collapse. VA regional need to stay in all their markets to keep QF on their toes and keep airfares reasonable. I also don’t know why people are saying the ATR is unreliable. I’ve had far more turn backs and delays in the Dash 8 than I have in the ATR, despite flying the ATR more often. They are not pulling out of MRB, they have upgraded recently to F70 and 100 jet services and they will continue, no announcement has changed that. VA should have reconsidered their scheduling for places like Bundaberg. For instance you cannot do a day return trip to Brisbane from Bundaberg.. You can with Qantas link for huge $’s. Some people have to go to Brisbane for medical appointments for the day and they can’t do this with Virgin….in fact there a lot of them who have to do this. Same if you are going on an International flight out of Brisbane. You have to go down the previous day, pay for a room for the night then catch the flight. So what are Virgin actually doing? They seem to be really great at screwing things up and not actually expanding or even consolidating!? What a joke. Lucky I sold my share long ago! I can now understand why Air NZ bailed out! Virgin do seem to becoming an airline that’s falling off the radar. Rationalizing the domestic fleet means many regional destinations must be coming off their network route map as 737’s, all but 4 of which are the large 800 series are just too big for many regional destinations & those that can handle a 737 will lose frequency. Not having a 100 seat option once the very comfy E190’s are gone seems a strange move indeed. So the question is that’s the way of their future or are they going to move some of their under utilized Fokker F100’s over from WA or tie up with Alliance or possibly even an enhanced Jetgo who’d have to expand to at least to E170 size planes to fill the breach successfully on behalf of VA. If it’s any of these latter equations then it’ll probably work. If they’re just going to be a low frequency service to those regional towns that are big enough to handle a 737, they’ll probably only serve once a day. Then they’ll only get leisure market passengers as business passengers must have morning & evening in/out options so VA may as well hand those routes over to their LCC arm Tigerair who’ll service the leisure market more efficiently than VA could. I thought Mr Borghetti would do well but so far he reminds me of PM Turnbull, full of promise but never actually delivers anything useful & apparently without a plan. I’d rather the gov’t allowed the very innovative AirNZ in to fly domestic around AU to give the not very good QF some actual competition! Virgin lost me as a Gold flyer with them 2 years ago when it was clear their international strategy to Asia which is very important to me was going to be served exclusively by SIA rather than themselves. SIA is a better airline to travel on than QF but with most of my international flying to HK & Manila plus occasionally China, Japan & Taiwan stopovers in SIN are just painful & time consuming. As such I remain a disgruntled QF Gold flyer until something better comes up. So there you go. VA are pretty much hopeless at international (outside of the US services) and are now bringing their domestic strategy down to the same level of uselessness. Good luck VA cause I think you’re going to need it with your current muddleheaded strategy. I wish it weren’t so. @Geoff Schaper – sadly I have to agree with you. I am a loyal VA customer and velocity member and I still think VA overall has in many cases as good or better product offering and generally friendlier/more customer focused staff than QF. However what is concerning recently is the latest trend to cut routes, aircraft, frequencies etc – Particularly in regional areas. Virgin should be innovative and get ahead of the QF game. They seemed to be doing that when JB first took over. Recently though this seems to have stagnated. From a purely business point of view I could understand the cost cutting if it was leading to profit. However it isn’t, they’re like a cat chasing it’s tail. Their thinking needs to be more strategic. Don’t reduce aircraft or give up on markets. Restructure the fleet so it can more directly compete with QF. Keep the ATR to directly compete with QFlink turboprops, Keep the Embraers to directly compete with QFlink 717s. Upgauge to A320/A321 NEOs on the mainline trunk routes. This would give a wider cabin, wider seat and better overall passenger experience than QF 737NG. At the moment both airlines are offering more or less the same aircraft so if this happened it would be a positive point of difference for VA. In the domestic or international widebody market, replace the A330 with the A350 to again offer a point of difference and better passenger experience than QF. They seemed to have trumped QF by going for the 777-300ER and keeping economy at 9 abreast. However the issue is they don’t have the frequency that QF does. So start thinking about a replacement now and order in numbers that can compete with QF A380s, 787s and remaining 747s. I’m thinking the 777X, A350-900ULR, A350-1000 or A380 NEO if it is launched. Having said all that, such a fleet strategy would require a massive capital investment, but if it was possible VA would leave QF floundering. However it surely has to be better than cutting costs with no result to match. I know this article is only talking about the ATR reductions, but it’s symbolic of a wider cost cutting regime at VA that lacks strategy or direction and is not reaping benefits.